Episode Guide | KIDS FIRSTWith Rosalie Greenberg, M.D. 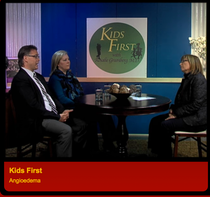 KIDS FIRSTWith Rosalie Greenberg, M.D. Thank you for making the show a success. Your talent is irreplacable & your quick wit will be forever missed. Rest peacefully, our director and friend. The thought of seeking psychiatric or psychological help for a child can be frightening. 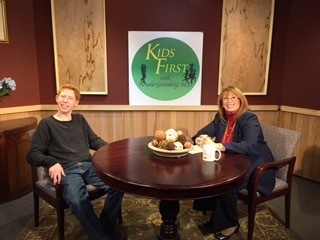 In this episode of Kids First, Dr. Greenberg talks with Jason Pyne, an 18 year old who has struggled with both, medical and psychological illness since a young age. Together, they discuss the years of various treatments his parents sought out, has helped him to become a positive, self advocating and educated young man today. Dr. Rosario Trifiletti is back to speak about P.A.N.S & P.A.N.D.A.S. Lyme disease is the most commonly reported tick-borne infection (TBI) in the United States. Transmitted by the bite of a blacklegged tick, the number of cases appears to be increasing across the United States and throughout the world. Youth are especially vulnerable, with the highest incidence occurring among children between the ages of 5 to 14. A parent needs to know about the various types of TBI’s in our area as they often occur together (called “co-infections”) and can cause many different types of problems including, fever, headache joint pains, chronic fatigue, “brain fog,” attentional problems in school, mood shifts, new onset temper tantrums, etc. This episode will be the first in a series discussing TBIs (e.g. Lyme, Babesiosis, Bartonellosis etc.) their prevention, symptoms, and approaches to treatment. Misophonia, literally "hatred of sound", is a neurological disorder in which negative experiences (anger, flight, hatred, disgust) are triggered by specific sounds. Dr. Jed Kwartler, Director of Otolaryngology Services for Summit Medical joins Dr. Greenberg to explain this interesting disorder. Dr. Greenberg is joined by Jesemine Jones & Ida Keiper, educators and founder's of Starry Night Travel, as well as co-author's of Starbrite Traveler: A travel Resource for Parent of Kids with Special Needs. Starbrite Traveler is a groundbreaking illustrated guide that gives families a well-organized, confidence building, easy to read, travel resource. The group also discusses the most recently published, Starbrite Traveler: Destinations for Kids with Special Needs, East Coast Edition which is another invaluable resource to help parents and caregivers of children with special needs choose destinations and attractions along the East Coast of the United States that are special needs friendly. “Every child gets earaches, sore throats, sinus infections and now that we’re exiting flu season and entering allergy season, hardly a week passes that something isn’t going on. I want to help parents determine when the ear, nose and throat symptoms that their child is experiencing are deserving of more intense medical attention,” explains Kids First host, Rosalie Greenberg, MD. Joining her is Dr. Huma Quraishi, a pediatric otolaryngologist, a specialist in disorders of the ears, nose and throat. The Thyroid: What is it? Where is it? & What should we know? Parents need to know about PANDAS/PANS. If their children experience debilitating changes in their behavior, seem to develop OCD overnight, suffer from extreme anxiety, severe mood swings, it's time to look at their immune system for an answer. August - 2011 - Is Technology Ruining Family Life?